I started pondering Memorial Day last night when a Facebook friend posted a link to the Lee Greenwood Song "God Bless the USA" This song stirs up many emotions inside of me. Last night was no exception and as usual, the song moved me to tears. I thought of the fact that both of my grandfathers served during World War 2. I thought of my father who served in the Army during the Korean War. I thought of my uncles, especially my Uncle Wayne who went to Vietnam. I even thought of my cousins who have served in the military. I thought of my husband who served in the Army National Guard during Desert Storm thought his unit was never called to active duty and thought of my friends who did serve active duty during that time and I thought of my husband and all the soldiers I knew who served during the recent Gulf War and who continue to serve in dangerous places to ensure freedom. I did not like having my husband "playing in the big sandbox" when a war was going on even if he wasn't on Iraqi soil. Politically, I did not agree with the war, but even in the midst of my disagreement I was keenly aware of the fact that it was men (and women) who fought for my freedom to have the right to disagree! And though I did not agree with the war, I do support the troops. I am grateful for their willingness to serve their country. I am grateful for the service members who have given their lives so that I have the freedoms that I do. I am not always proud to be an American. I cringe at the stereotypical image of American Tourist in Europe. I am not always proud to be an American when I see my government making choices and polices that I think are wrong or detrimental, but I am always grateful to be an American. I am grateful for my freedoms. Today, in gratitude, I remember those who fought (and some died) to give me those freedoms. If gratitude is part of pride, then I am proud to be American and my heart swells with pride for those who serve this nation. It has been a long and busy week. Since Sunday is the first day of the week, I'll include Sunday's activities in my list. The weekly schedule included a special vespers with kneeling prayers following Divine Liturgy, Altar Feast for Spirit Monday followed by a luncheon, Bible Study, Physical Therapy for Supergirl, seeing a friend perform in a school play, playing piano for the local nursing home and our weekly piano lessons. Are you tired just reading that? And that doesn't include home school lessons, housework and meals!! 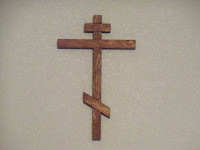 This is the new Byzantine Cross we hung above our bed this week. The top bar is where the title "King of the Jews" would have been. The diagonal bar at the bottom is the foot board. This is the board the crucified person would have used to push himself up to relieve the pressure. 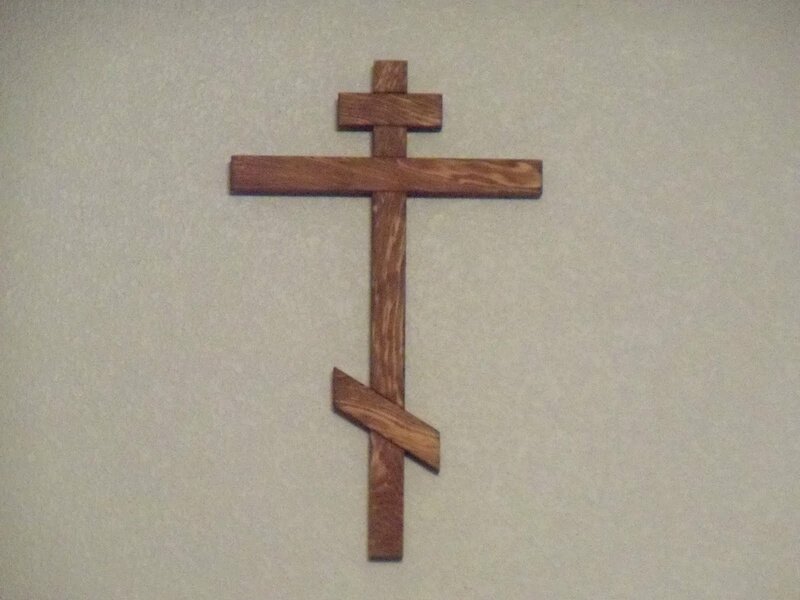 When I look at the cross, I am reminded of a love so strong and so deep that it is incomprehensible. I reminded of the price paid to redeem me. Each time I walk into my bedroom I see this beautiful reminder of my faith and I know that when I seek Him, he gives me strength. I smile when I see the cross because I have this joy, peace, and contentment that sustains me even in the midst of the busyness of this week. God also knew that I'd had enough. Unexpectedly we'll be taking a day off tomorrow. Piano lessons were canceled this morning and my honeybear got a call from his boss to enjoy an extra long weekend. The timing is perfect. Thank you Lord for Your perfect timing. A very dear friend of mine sent me this fun little "math joke". Work this out as you read . 5. If you have already had your birthday this year add 1760. If you haven't, add 1759. (i.e., how many times you want to have chocolate each week). RosieBear asked me how does it work? Or rather why does it work. So I did some internet searching and discovered that it is an algebraic formula and it is really simple. Ever want to know how old someone is but you only know their birthdate? How would you find their current age? You'd take the current year and subtract the year of their birth. If they haven't had their birthday yet, you'd subtract one year. So since honeybear was born in 1971 and hasn't had his birthday yet I'd do this: 2010-1971=39 but he hasn't had his birthday yet so 39-1=38. He's 38 years old. I do this frequently for trying to remember how old my Grandparents would be if still living or a couple of weeks ago to verify how old my dad would have been on his birthday. 2010-1936= 74. My dad would be 74 right now if he were still alive. Now you may be saying.. but Tess... it doesn't ask me what year it is and it's having me multiply by 2 then add 5 and then multiply 50 and then add some strange number. Ah! But *it* has taken the current year into consideration! The formula that I found on the internet ( How does "Chocolate Math" work is just one of the several sites I found) in algebraic form has the year "hidden"!!!! Current Year - 250 = number to add in step 5 if you have already had your birthday. Current Year- 251= number to add in step 5 if you have NOT had your birthday. I found sources for this "Chocolate Math" from 2004, 2006, 2007, 2008 and 2009. Exact wording, too. The only change was the number you add in step 5. Rosiebear learned that math really can be fun. It can be tasty too if you actually get to eat the chocolate! Once upon a not that long time ago, I had a laundry system that worked for me. I didn't have to worry about conquering Mount Washmore because it was only a mole hill and I refused to make a mountain out of a mole hill. It was a very simple laundry system. Each day I would do 1-2 loads of laundry and I would fold each load *as it came out of the dryer*. Sometimes I would start a load at bedtime, transfer the load in the morning and start my second load. My sorting system was very simplistic. I had two sets of two hanging mesh bags. In one set were the clothes: one bag for colors, one bag for whites and very light colored clothes. In the other set I had a bag for towels and another for sheets. All clothes were washed in cold water. All sheets and towels in warm water. I redefined what "caught up" on laundry meant for me and this was one area that I had completely conquered. I ruled over the laundry; it did not rule over me. Whatever bag held a full load of laundry was the load that got washed. Sometimes this meant that there was indeed dirty laundry but if there wasn't a full load, I didn't stress. It would get done the next day. I didn't always have that laundry system; it was born out of a need to simplify. When we lived on the East Coast, I had a laundry room in the basement. I had a complicated laundry sorting system but I had the space to implement it. I used laundry baskets for sorting and I had lots of them. I sorted by color *and* whether I should wash in cold water or warm water. If that wasn't complicated enough, I also sorted by laundry detergent. I had piles of baby clothes to use with Dreft or whatever "baby" detergent I was using and piles of "normal" detergent. I did laundry once or twice a week and to be "caught up" on laundry meant that the only dirty laundry in the house were the clothes on our backs. It was complicated but it worked for that season. The army moved us to a Fort in the middle of the country. The house was smaller. Laundry facilities were now in my *kitchen*. There was NO place to implement my wonderful sorting system. Thus was born the *overly* simplified version. 1 *maybe* 2 loads of laundry *everyday* and the only sorting was clothes in one basket and sheets and towels in another. It worked while we lived there because I could NOT have piles of laundry. The house was just small. Then the army moved us again. This time to our present location; 9 years ago. I implemented what I thought of as my "perfect laundry plan". It worked really well for a number of years. It worked so well that I had a hard time understanding all my friends who complained of piles and piles of laundry and then one day it didn't work anymore. It's NOT working. Laundry is no longer a mole hill it is a mountain and it has a name Mount Washmore. Currently, thanks to 4 daughters who folded several loads this morning, I only have a load of clothes drying in the dryer. I do have 1 or 2 loads of towels to wash. I think I saw a load of blankets to be washed and I'm guessing that there might be a load of dark clothes to wash. I've been using the same sorting but one of the dual mesh bags bit the dust a few years ago. I replaced it with a sturdy hamper. It holds sheets and towels. I still only wash sheets together and only towels together but I only have space for one container. But I just can't seem to get laundry folded and put away consistently so dirty clothes don't get washed because the clean ones are sitting in the baskets. We get those folded and put away and then I push to get a bunch of laundry washed and then it sits. I need a new laundry system. Today's plan: create a new laundry plan/system. It's time to conquer the mountain in a new way. I am so excited! I get to be a part of The Old Schoolhouse Homechool Crew for the 2010-2011 year. As part of the Crew, I will have the opportunity to review different products. The current year is winding down and the new year will begin in July. I don't know what this year will bring, but I believe God's hand is all over this opportunity. TOS solicited applications earlier in the spring. Although my dear friend Debra encouraged me to apply, I just did not have peace at that time. I really struggled with whether or not I should apply, but life was so overwhelming and I choose not to apply. 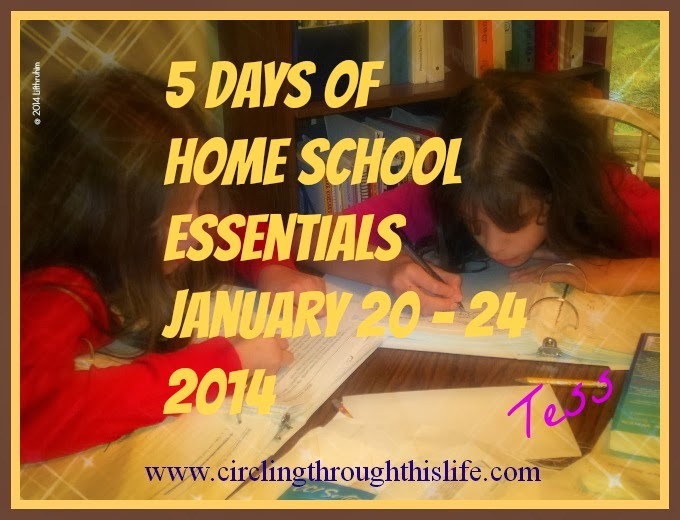 Fast forward several weeks to early last week and I was praying about our home school. I even thought "it's too bad I didn't apply to the Crew". Meanwhile, I also felt the "it's time" pull to return to my blog and start blogging again. Coincidence? I thought so at first, but then my friend Debra posted (with permission) a request from TOS for bloggers with flexible schedules and children in grades 7-12. Debra strongly encouraged me to contact Heidi at TOS. So I did . I gave Heidi my name, told her about the children, gave her my blog link and supplied her with some samples of reviews I'd written elsewhere. It was thrilling to receive the email this morning with the The Old Schoolhouse graphics welcoming me to the Homeschool Crew. The girls are excited. BooBear said it she likes the idea of not being exactly sure of where we're going in terms of curriculum. I like that it is a tangible journey of trusting the Lord and His provisions for my family. Revenge of the stinging creatures? I don't know if it's some strange sense of cosmic irony or just a mere coincidence but yesterday a wasp decided that my BooBooBear was the enemy. Boo was happily playing "Waterballoon Toss" with her friends and sisters when she felt something in her skirt. She wasn't even sure at first if it was a bee sting or just an insect bite of some kind but looking at it we determined it really was a sting. We weren't sure *what* stung her though but our wonderful friend Kim grabbed some baking soda and made a paste. But here is the amazing thing: It was *still* in her skirt! We didn't know it was there. She stood up and it fell out of her skirt. I think it is a miracle that it didn't sting her again! And she said it didn't hurt that bad. It was a very mild reaction. Ok.. can I be done now with stinging things? In my van? Up my daughter's skirt? I thought they were supposed to pollinate flowers? That is the kind of stinging creepy crawly insect variety that seem unusually attracted to my van. A week ago, during piano lesson time, I took super girl to McDonalds. I thought I was being really smart with my parking choice. This time, I parked in the handicapped spot (Supergirl has Blue Handicap Placard). It's a little farther from the door but the last 3 times I parked closer to the door I ended up blocked by a delivery truck! So, I'm a little slow at this parking spot planning idea but by last week, I had learned my lesson. I didn't really pay attention to the fact that next to this particular spot is tree. Not just any tree though. A tree in bloom. After she ate her chicken nuggets, and refilled my Dr. Pepper, we headed out to the van. To my *horror* there were not one, not two, not even three but FOUR, yes FOUR wasps who had decided that my van was the place to hang out. One decided the door on driver side was the perfect place. Two more thought the driver side mirror was the coolest hanging spot while the the fourth horrible creature planted itself in the middle of the wiper blades on the front windshield wiper. Well actually, I didn't notice *immediately*. I started to open the sliding passenger door on the driver side to help Supergirl get in and that's when I noticed them. Quick as I could, I closed that door and diverted supergirl to the other side. All the while wondering how *I* would get in without letting in any extra passengers. I opted for climbing in the sliding passenger door and sliding, with great difficulty, into the driver seat from the passenger side. I'm so thankful that the arm rests can be moved out of the way! *sigh*.. so I'm in. She's in and so far no extra passengers. Time to pull out and hopefully those things will fly away. Except that the light is red and no one is moving and OH NO but one of the doors is NOT closed properly. The van is beeping at me because I'm trying to drive but the door isn't properly latched. Which door? The sliding door on the passenger side (oh please let it be this one) or the sliding door on the driver side (the side the cling ons seem to prefer). Instead of pulling out of the parking lot, I drive further into the shopping center to see if said creatures would fly away so I could close the door. No such luck. I finally pull into another parking spot. My new dilemma: how to get the door properly closed without letting in any extra passengers. So I slide out of my driver's seat. Stooped over and in the middle of the van, I reach over to the sliding passenger side door. Quickly, I open and close the door. Lights are still on which means that it is the other side. The side with the stinging insect convention. The side that has Supergirl's booster seat. Reaching in front of my daughter and praying that I don't let anything in, I open the door and slam it shut. I say a prayer of thanks that I didn't slam any fingers or hands or other body parts in the door and that I didn't let anything else in either. So I start to drive. Door is no longer beeping at me but now the gas gauge is letting me know that I will NOT have enough gas to get home after picking up 3 girls from piano lessons. Another dilemma: How to put gas in van when stinging creatures prefer to lounge on the same side as the gas tank. I keep driving. At first I decide that I will NOT get gas. Gas tank beeps and lets me know that this is really not an option. Then I decide that I will pick up girls and then figure out the gas issue. At least the girls can get in the van quickly on the wasp free side of the van. Finally, I was able to get the van up to 40 miles an hour (the legal speed limit) and one by one the wasps got tired or bored or whatever and left. I was able to pick up the girls *and* get gas. So, now today, having learned my lesson about wasps and trees and keeping in my mind my previously learned lesson about delivery trucks, I find a different parking spot. Supergirl enjoys her chicken nuggets. I enjoy my Dr. Pepper and we head to the van. To my delight there is neither a delivery truck nor a wasp convention. Yippee!! I found the right spot. So off we drive to pick up the girls. I park in my usual spot in front of Miss M's house. As I sit in the van and wait, what do I see? I'll give you a clue. It's ugly. It has yellow and black stripes. It has a yellow face. Did I mention that it is ugly? It stings. It is a yellow jacket and it is on my windshield. I am now staring face to face with this thing and I'm wishing it would fly away before the girls come out. I don't want to turn on the windshield wipers because I could just see the girls coming out just at the same time that I make this cling on mad. So I decide that since I am a little bit early I am going to drive around the cul de sac. Maybe it will leave. No. I can see that it is cling on for dear life. Since I am driving, and I feel safe, I turn on the windshield wipers. The stingy monster STILL CLINGS. After four or five hits with the wiper, the yellow jacket FALLS off. Whew. It's gone. I can go back to my post of waiting for my girls. So without much thought, I park..... in the exact same spot. I sit and I wait and oh no.. there's ANOTHER ONE! This one prefers the side mirror on the passenger side. I start playing with the mirror. I hope to crush or trap it as I move the mirror from side to side. Nope. So I move it up and down. This does have the desired effect and creepy crawly thing flies away. I decide I better move the van and do a quick drive around the cul de sac and this time I pull into the driveway. For the next 5 minutes or so I keep watch. When the girls come out, I roll down my window just a tiny bit and tell them to get in as quick as they can and close the door. Thankfully I add 3 daughters to my van and NO other creatures. With 4 daughters and no stinging creatures we head home to enjoy the beautiful sunny day. I haven't been keeping up with my blog and here we are nearly halfway through the New Year. My life and views have radically and dramatically changed since I started this blog but yet I am the same person, loving and serving the same Lord; I just look at life from a different angle now. Oh some things are still the same. Our faith is still the grounding and centering of our lives. I still believe that my husband is head of the household. We still have four beautiful daughters and we are still committed to home education. But some things are different. We pray more regularly as a family. We have more peace and contentment. We are more actively involved with our church. So what brought about this change? In my last post from last September, I mentioned that we were striving to answer the question "What do we believe and why do we believe it?" As we began to study early church history, our paradigm began to shift. We left our old church and began to experience the ancient faith: Eastern Orthodox Christianity. In February, Valentine's Day to be exact, I made the most important commitment of my life. Yes, more important than marriage; more important than my children. A commitment with eternal consequences and one not to be taken lightly. On Forgiveness Sunday, February, 14, 2010, through the Holy Mystery of Chrismation, I was received into the Holy Orthodox Church. My husband and 4 daughters were also received into the Orthodox faith that day. It feels so good to be home.